Every year, my friend Steve does his Snoopy dance around their Christmas tree. Now, theirs (currently) isn’t as pathetic as Charlie Brown’s.. it’s just a nice litle ritual he has. This year, though, wouldn’t it be nice if he had the actual tree to dance around? 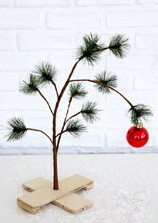 The tree is an exact replica of the tree from the famous cartoon, made of wire branches and plastic needles with a criss cross wooden base. The bendable branches allow you to make it look just how you want, super pathetic or just kind of pathetic. The tree comes with one red Christmas ball ornament. I know he’s looking forward to it again this year.. maybe he’ll even wear his Charlie Brown zig zag shirt. I SOOOO need one of those!